Combining science and quality family time can be a rewarding and educational experience. Here is a tip on a fun experiment that you can perform the next sunny weekend afternoon – playing with astronomical distances. Many of us learned about the immense distances between objects in the universe. To have the kids get a firm feel for the magnitude of these distances, we can use an analogy with something familiar. Take the family basketball and make it represent the Sun and map out a distance that is in the same ratio as the basketball’s radius to the Sun’s. For example, you can calculate the distance from the basketball Sun that represents the distance to the dwarf planet Pluto. This comes out to be about a half-mile (or a few city blocks). To make the game more enjoyable, you could pick a starting point in an interesting neighborhood in your town, and actually walk off the length to demonstrate astronomical distances. Remember to mention, as you reach Pluto’s location, that this distance represents the start of the Kuiper belt (the area past Neptune with millions of small icy bodies). 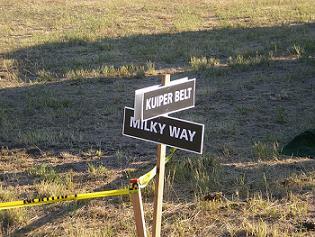 Next, you can walk 12 more blocks which gets you to the outer reaches of the Kuiper belt. Delight the kids by mentioning this represents about 5 billion miles in the Sun’s actual scale. You can go further with the basketball Sun analogy and plan a family road trip to get to the beginning of the Oort Cloud (home to billions of comets). This would take the family a distance of about 34 miles from the basketball Sun. You might select a fun destination at this distance so the family can relax and reflect on being at the outer rungs of the Solar System – maybe an amusement park, beach, hiking trail, or Grandma’s house! Now if you wanted to demonstrate getting to the most distant part of the Oort Cloud, you’d have to go a bit father – about 1,700 miles. You could save that trip for summer holiday. Just don’t forget to remind t he kids that they’re now at the edge of the Solar System as they’re munching on a piece of Grandma’s apple pie.